A Way To Better Understand Why The Turning Away From God in the Novus Ordo Mass is a Grave Sin and Defines the Abomination of Desolation. 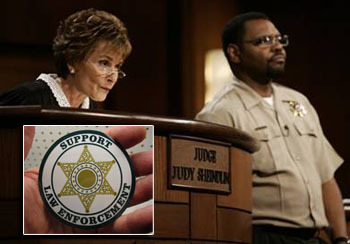 Consider for a moment that you were in the courtroom of a very rich and powerful Jew such as Judge Judy Sheinlin. 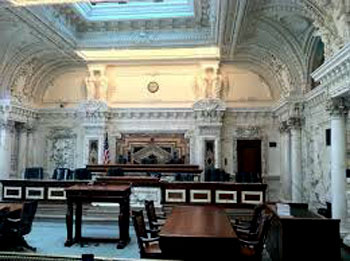 You may look around and notice that a Masonic government courtroom is quite impressive. It spares no expense in its construction details which usually feature fine wood trim, marble walls, impressive carvings, a strong stone exterior architecture featuring extravagant columns, domes, impressive staircases, and of course the subtle symbols of Masonry built into its walls. 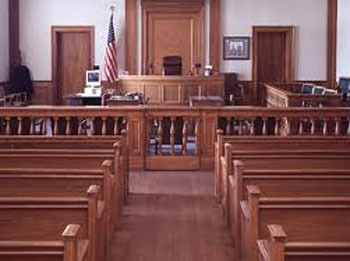 You might also notice that design of the Jewish Government Courtroom is laid out in a familiar way if you are Catholic, you may have noticed its similarity to the interior of a Traditional Catholic Church. This is no accident. This is done by design by Jewish-Masonic governments for several reasons. 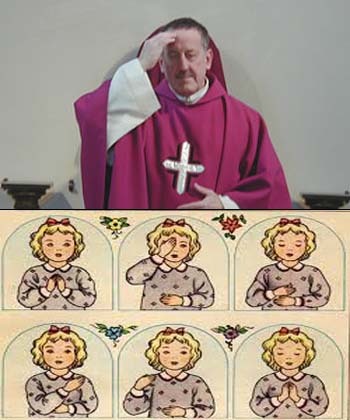 In order to better understand the tragedy of the Vatican II New Order Mass and how it insults God, let's establish a comparison between a Jewish courtroom ceremony and a Latin Catholic Mass from a Traditional (pre-1969) Catholic Church. The reason for using a Traditional Catholic Church is because in 1969, most communion rails were destroyed, the altars torn out and destroyed, and Priests performing the Mass were ordered to turn around to face the people. Although 32,000 priests left the priesthood in protest, this New Order Mass or “Novus Ordo” Mass still is attended deceived Catholics still to this day. 1. 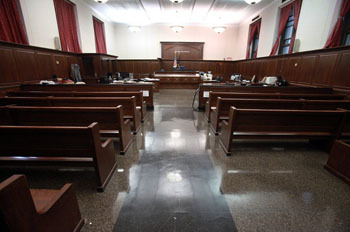 In a Jewish courtroom, a wooden altar distinguishes the Jew (who usually thins of themselves as a God) from lawyers and courtroom personnel and is the focal point of the interior. 1. In a Catholic Church, a wooden altar distinguishing God from the Priests and Servers is the focal point of the interior. 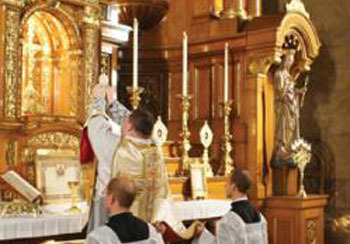 God is the focal point of the Traditional Catholic Mass. 2. 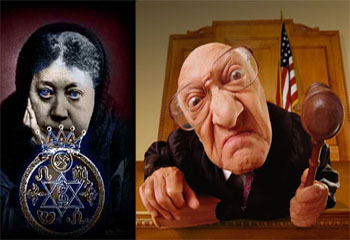 Jewish Judges are adorned with robes, symbolizing their role as an administrator of an implied divine power (administering Mosaic Law, forgiving sins against the Jewish State, etc.). 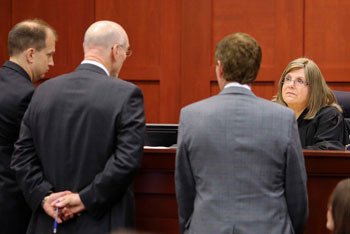 Lawyers must wear respectable outfits when facing the Jew in the courtroom service, usually a suit or a pantsuit. 2. Priests are usually adorned in robes, a symbol of authority as administrators of Divine Power. A Catholic Priest wears a robe called a vestment, which symbolizes his role as an administrator of Priestly Power (administering Sacraments, absolving sins, etc.). 3. In the Jewish courtroom, a rail separates this “holy ground” where the Jewish Judge and his/her lawyers stand apart from the rest, distinguishing themselves from the commoner audience. 3. 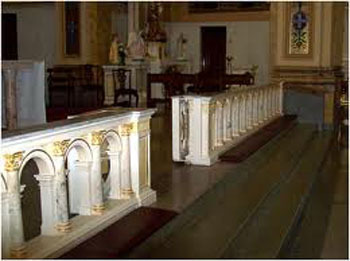 In a Traditional Catholic Church, an altar rail separates the “Holy Ground” where God and Catholic Priests stand apart from the rest, distinguishing themselves from those attending the Mass. 4. 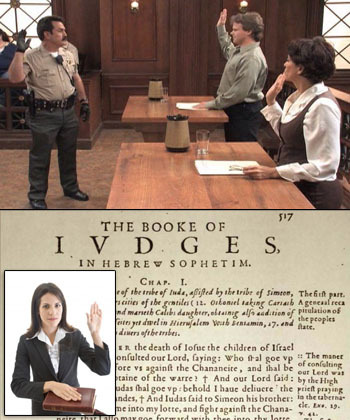 In the Jewish Courtroom Service, there are uniformed Police adorned with Stars representing the Law of their god, the Lord, and symbols of their god such as guns and handcuffs to intimidate those who might not be compliant. 4. 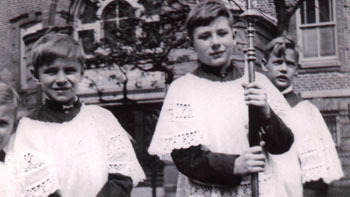 In a Catholic Mass, there are uniformed Altar Boys. They are usually adorned with vestments and symbols of Christ, the God of Catholics, such as a crucifix. They assist the Priests in the saying of the Mass. 5. There is an implied power that is drawn from the elegant interior decor of the courtroom that causes regular people to assume that some divine authority must have been behind its design. 5. 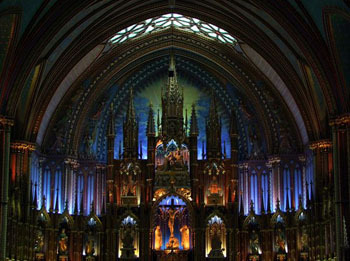 There is an implied power that is drawn from the elegant interior design of a Traditional Catholic Church that causes regular people to assume that some divine authority must have been behind its design. 6. Wooden church style pews provide seating for those attending the Jewish justice ceremony. 6. 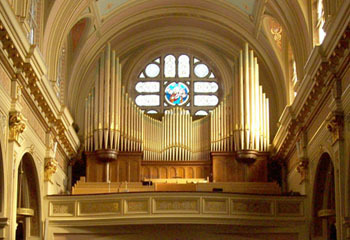 Wood Church pews provide seating for Church-goers attending the Catholic Mass in remembrance of God's Crucifixion at the hands of the Jewish Court. 7. 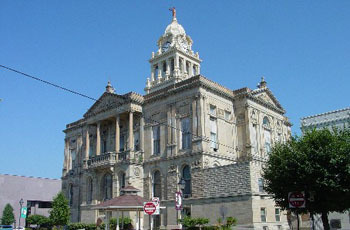 The courthouse in many towns is usually constructed in stone and usually distinguishes itself from other structures in town by showcasing its prominent architectural features, its massive presence and the implied authority derived from its design. The architectural purpose of this is to lead the general public to assume something important was behind its construction, something that should be respected. 7. 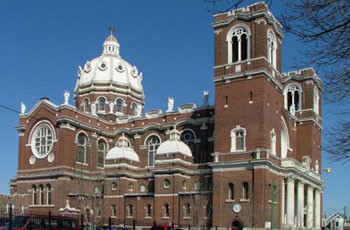 The Catholic Church in many towns is usually constructed in stone and usually distinguishes itself from other structures in town by showcasing its prominent architectural features, its massive presence and the implied authority derived from its design. The architectural purpose of this is to lead the general public to assume something important was behind its construction, something that should be respected. 8. 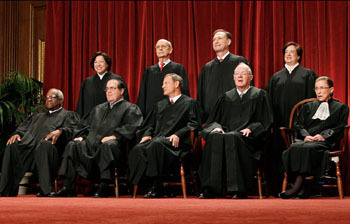 At the beginning of a Jewish justice ceremony, an announcement is made by the Court helper that the ceremony will soon begin. The audience is instructed to stand as a sign of respect as the “honorable” Jew enters the room. 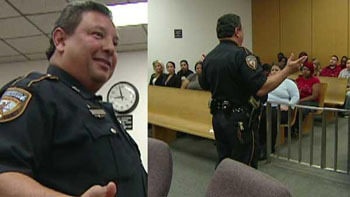 The Judge then orders the crowd to sit down. 8. 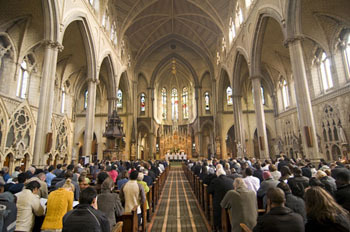 At the beginning of the Catholic Mass, a cue is given (usually with the accompanying music) that the Ceremony will soon start. The Church attendees are expected to stand out of respect for the Mass. The presiding Priest then tells those in attendance when they can sit back down. 9. 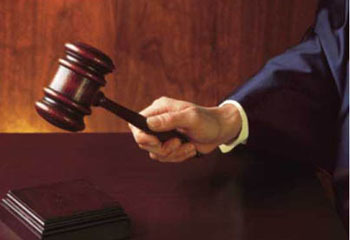 It is customary for the Jewish Judge to order an oath be sworn on a Bible (which was written by the Jews in collaboration with Satan) to “tell the truth, the whole truth and nothing but the truth, 'so help me God', which leads the plaintiff, defendant or witness to believe that this Jewish service derives its authority from God. 9. It is customary for the Priest to lead his flock into a declaration of Faith, prompted by the sign of the cross. 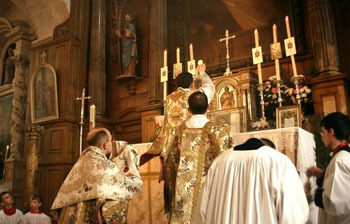 This implies that the Liturgy of the Mass about to be said receives its authority from The Holy Trinity, God. 10. As a sign of respect, lawyers are expected to face the Jew who holds authority over their freedom at all times during the service, standing with their backs to the people in the audience. This sets the tone for the audience who must obey the Jewish Judge by following the example set by the lawyers who make their living pleasing the Jewish Judge. 10. As a sign of respect, Priests are expected to face God during the Mass, with their backs to the people in the pews, symbolizing a shepherd leading his flock to the proper worship of God. 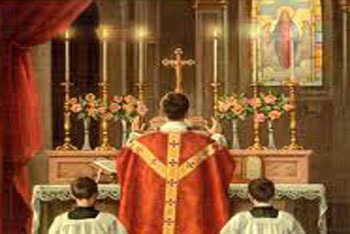 This sets the tone for the audience who must obey God by following the rules of the service, following the example of the Priests whose job it is to teach the proper worship of God in the Catholic Mass. 11. Mosaic Laws of Jewish Justice are administered via legal rulings handed down by a Jewish Judge. This false justice is available to regular people only if they retain a lawyer at great expense because Jews generally do not lower themselves to speak down to regular people in the courtroom. The “Power of Justice” is expensive and not designed to benefit non-Jews, which is why many goyim seek the counsel of Jewish attorneys. Very often the combination of Jewish curses and the exhausting financial hit of the Jewish Courts leave many in a state of shock. 11. 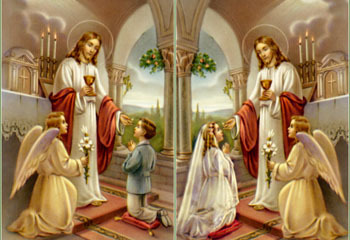 The Power of God is administered via the Sacrament of Communion through a mediary which is the Catholic Priest. Priests perform the Rite of the Mass and are trained to administer the Seven Sacraments, acting as a mediary between God and the people. Priests are initiated into service to God after passing through Seminary and going through the Ordination Process. The Sacraments are designed to protect Catholics from the one-two punch of Jewish curses (Rosicrucian Experiments) and “Jewish Justice” which is designed to steal as much wealth from them as humanly possible in the form of legal fees. 12. 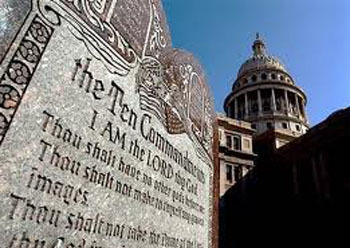 Courtrooms are decorated with spiritual icons of living and dead Freemasons like Moses who helped establish this system of “Justice.” This courthouse is adorned with the words of “their Lord” (Satan), the god of the Government. 12. Catholic Churches are traditionally decorated with Holy Icons of God or paintings of Saints who fought to keep the Catholic Faith alive. 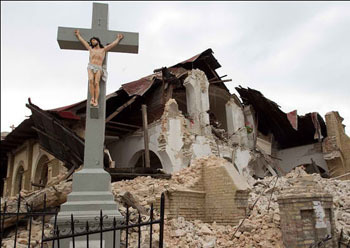 This Vatican II Church in Haiti was not approved by God. 13. 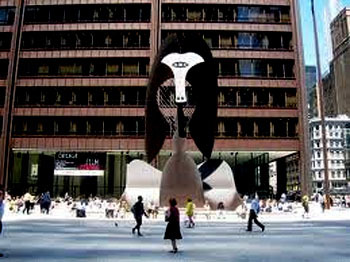 Some courthouses like Chicago's Daley Center Cook County Court Building feature large sculptures of black birds, such as this Picasso, which symbolize the presence of the Holy Spirit (the Devil). 13. 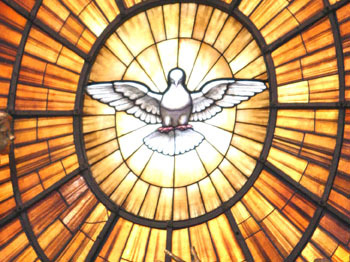 Some Catholic Churches feature large sculptures of white doves, symbolizing the presence of God the Father, The Holy Ghost. 14. 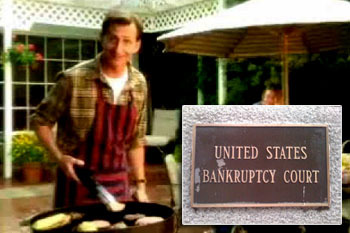 Jewish Judges in Bankruptcy Court have the power to absolve debt to anyone who purchased crap they could not afford. This “sacrament of absolution from debt” frees the poor man from his sins against the Masonic financial system, which of course has the power to print more money via its Jewish-run Federal Reserve Bank scheme. Bankruptcy Courts know the Masonic system and are funded by it, but attempt to keep this knowledge from the goyim who have made gods out of the junk they bought, working for their junk day and night, and complaining about being in debt up to their eyeballs. 14. 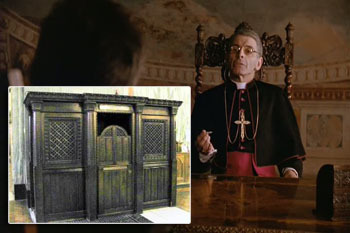 Catholic Priests have the power to absolve sins by administering the Sacrament of Confession. This absolves the sinner of crimes he may have committed against God. This Sacrament of Confession usually occurs before the Mass in a Confession Booth located somewhere inside the Church. In this famous scene from “Godfather III”, a corrupt Cardinal laments the fact that the power of absolution from sin has been replaced with the power to absolve debt. The implication is that people value money and absolution from debt more than they value the Sacrament of Confession and the forgiveness it offers. The purpose of this comparison is to rhetorically ask the Vatican II Novus Ordo “Catholic” a simple question. You would probably never consider turning your back to a Jewish Judge in a Court “of law”, then shake hands with the people and call it a “supper-party.”...you'd probably get arrested, thrown into jail, and get charged with contempt of court. And of course you would never attend a play, or a concert, or any other form of entertainment with your back to the performer. So why would you even think of supporting Vatican II “Priests” and their leadership who have been insulting God in Freemasonry's Novus Ordo Mass for the last 43 years? Do you actualy think you will get away with it? We all know what the Jewish Judge Judy would say, but what do you think God will say if you get to meet Him face to face? Vatican II Cardinal and Jewish Freemason Bernardin sits on his throne, his back turned to God, eschewing himself as if he was God in the installation Mass of the Talmudic Cult Opus Dei at a former Catholic Church in Chicago, 1992.